What Really Happened When the Rooster Crowed? Dr. Joel Gregory tells the story of a neurotic rooster. Joel won’t mind if I embellish it a bit, but I heard the story first from him. And I offer this disclaimer: This story is not intended to harm or defame any rooster, living or dead, and any similarity to any rooster living or dead is hereby disavowed, is unintended, and, should it occur, is completely accidental. So there. If pharmaceutical pushers feel the need to spend three-quarters of their ubiquitous and usually annoying commercials spouting off lawyer litter, maybe I should sleep better knowing I’ve done proper rooster risk management here. It seems that the rooster in question was quite an intelligent creature, or at least, observant. His education was a little lacking, though, or he might have known something about the post hoc, ergo propter hoc logical fallacy. That’s Latin for “after this, therefore because of this.” An example (for which I apologize) might be, a fellow eats too many beans and the result is predictable. Right at the moment of the predictable result, a sinkhole suddenly appears two houses down the block and swallows up Fluffy, his neighbor’s cat. His conclusion? Flatulence causes sinkholes and feline fatalities. He is wrong, having fallen foul of, blundered right into, the post hoc, ergo propter hoc fallacy. Here’s a more serious example of the fallacy: The number of vaccines kids are getting is increasing, and the number of kids being diagnosed with autism sometime after being vaccinated is increasing; therefore, vaccines cause autism (this example from the Wikipedia article on this fallacy). No. Back to the story. The rooster in question fell into the fallacy in focus. 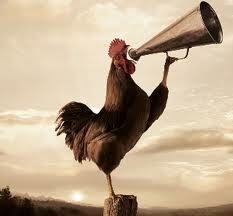 You see, the rooster noticed that “everything” started every morning whenever he crowed. Not least, the sun itself came up when—the bird soon was saying “because”—he crowed. This went on for a while, but before long, this bird turned into an insomniac rooster. You see, he was a very conscientious bird, albeit weak in logical thought. He could sleep hardly at all because he was so terrified that he might not wake up in time, might not crow at the appropriate moment. And then the sun would not come up, and everything would not start. I wish the story had a happier ending, but the sad truth is that the poor bird was finally carried off to a home for troubled roosters. It might be, be careful what you crow about. Or it might be, remember that your crowing is not all it’s cracked up to be. Or it might be, open your eyes more and open your beak less. This universe has one King who has been and will be King from everlasting to everlasting. He loves you completely. He loves me completely. He made us to be loved by Him and to praise Him. Forever. It seems logical that any time we spend crowing ought to be spent crowing about Him. If, for example, Satan can get our attitudes poisoned, he’s just as happy for us to go to church on Sundays as he is for us to sleep in. Once we’re there, opportunities abound for just a little venom injected here and there to poison our attitudes and twist our thoughts. The point is to get us completely focused inward on self and not upward on God. If we’re in “God’s house” but bordered on all sides by “me, myself, mine, and I,” Satan smiles a snaky smile. It’s so easy for the old viper to direct our gaze! Anything from Sister Smithers’ weird hat to Brother Gunther’s strange tones to the preacher’s annoying speech habit or the pianist’s missed keys will do the job quite well. “Go on to church. It’ll do you good,” Satan whispers. Notice a little lisp? It’s caused by that slit in his tongue and his need to speak around fangs. If we go to worship to bow before ourselves as consumers of religious goods and services, Satan would far rather we go to church than stay home. That snaky lisp is never more apparent—all those S sounds, you know—than when Satan whispers in our ears, “Enjoy yourssssssself. Worship, like everything else in your life, is all about you, your needs, your desires, your tastes.” If we listen, that snake is close enough to put a fang through our ear lobes. No big bites needed when a subtle but poisonous little pit viper drip will do the job every bit as well. “Why not go to church?” he asks, knowing that he has done some fine work there. Of course, the opposite has also worked admirably, too, from his point of view. He’s equally happy for ol’ Joe Blow to blow on about “all those hypocrites at church” if such smog helps Joe coddle the hypocrite under his own hat. 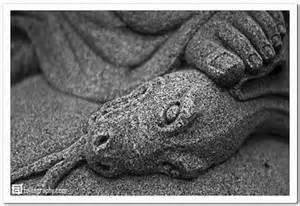 The serpent is not particular about the type of poison he uses or the rate of its effect, just as long as it is deadly. Crafty he is. And too close for comfort. A snake of the subtlest sort. Hmm. I may have heard him whisper in my ear a time or two as I’ve been trying to write this column. If that question catches you off guard and you’ve really not thought of asking it in a long time, chances are good that you really are. Happy, that is. 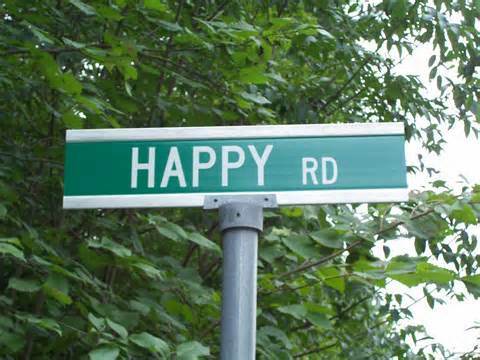 Another sure-fire path to unhappiness is to spend a lot of time around: 1) navel-gazers always asking themselves if they are happy, and, 2) folks who feel guilty when they are happy (as in “content”) too long. Chase happiness as a goal and you’ll always chase it away. It won’t and can’t be produced that way because by its very nature, real happiness is the sweet fruit of living a life not centered on self. I’ve tried to think of some common qualities the happiest people I know seem to share. The happiest people I know come from families who are good at being happy. If you don’t, don’t despair. Somebody has to choose to get the happiness trend started. Might as well be you. If you don’t know how to, get help. It’s available. By the way, happy people know that making excuses for being unhappy means planning to stay unhappy, so they are brutally honest with themselves and utterly refuse the sick “pleasure” of playing the victim. The happiest people I know understand something about balance. They work and play equally well, in ways that build up and don’t tear down. The happiest people I know like their work but love their lives and know that work is just part of their lives, not the whole show. I’ve known over-achievers I’d say seem happy but their “Type A-ness” is more a challenge to their happiness than conducive to it. And it can be challenging indeed to the happiness of those near them. The happiest people I know take pleasure in recognizing small things as great blessings. Sunrises, sunsets, naps, flowers, grandkids, puppies, good books, good food, sweet songs, hugs. The happiest people I know laugh often and know that life is far too serious business to always take seriously or to always be business. The happiest people I know invest time in friends they not only can trust but whom they can trust themselves to. Real friends around whom they are always lifted up, not convenient counterfeit friends who bring needless pain and shame. The happiest people I know are deeply content and not ashamed of it. It’s a balance thing. Not stagnant at all, neither are they “driven.” They enjoy their own company, but also have deep friendships. They have goals but keep their eyes open to the joys along the road. They know instinctively that it is on the journey, and not in reaching the goal, that life happens. The happiest people I know not only love life, they love the God who gives them life. They know he loves them and that when he looks at them, which is always, he looks at them with eyes filled with a Father’s joy.